FT: I’ve known Oscar for 25 atau 30 years (laughs). I don’t know. For a long time. FT: And I met Hugo in the Madrid Team. At that time they took anyone on, as anda can see. And I went to school with Elias in Fuenlabrada. Torres took his tally of league goals to 24 oleh clinching a 2-0 win at Tottenham, edging ahead of Ruud mobil van, van Nistelrooy's record for goals scored oleh a foreigner in a rookie season. Benitez bought 'El Nino' for lebih than £20million from Atletico Madrid last summer, which appears a bargain for what the Spain striker has delivered. Fernando Torres set a new record for goals scored oleh a foreign player in a debut Premier League campaign as he helped Liverpool to a 2-0 victory over Tottenham at White Hart Lane. Two goals in five detik half menit from strikers Andrei Voronin and Torres, who broke former Manchester United meneruskan, ke depan Ruud mobil van, van Nistelrooy's 23-goal tally, secured a comfortable win for Liverpool in a classic end of season affair. Fernando Torres yesterday equalled a 46 tahun old record of a Liverpool player scoring in eight consecutive games at Anfield. The only other player to have done that was the Anfield legend Roger Hunt in 1962. Torres also equalled the record amount of goals scored in the Premiership in a debut season, previously held oleh Ruud mobil van, van Nistelroy when he first joined Man Utd. Rafael Benitez, the Liverpool manager, has described Fernando Torres's first season in England as "amazing", however he was warned the Spaniard that he will find life tougher selanjutnya season. Torres scored the winner today as the Anfield side battled to a 1-0 win over Manchester City and the Spaniard believes that lebih consistent League success is a possibility in the selanjutnya campaign. Initial concerns regarding the fitness of Liverpool striker Fernando Torres will be assuaged oleh the news that the 24-year-old is not undergoing treatment today after his substitution in last night's Champions League semi-final. There was notable anxiety at Stamford Bridge among Liverpool coaching staff and fan alike last night when Torres, who had scored in the 65th menit to put Liverpool back on equal terms with Chelsea, was replaced oleh Ryan Babel with 20 menit of extra time still to play. Chelsea 3 West Ham 0 - Goals - Match laporan Check out the goals from Lampard, Malouda and most importantly Fernando Torres' first goal for Chelsea Watch It!!! Enjoy It!!! a poll telah ditambahkan: Fernando Torres was at his best in _______ ? What do anda think about Olalla? 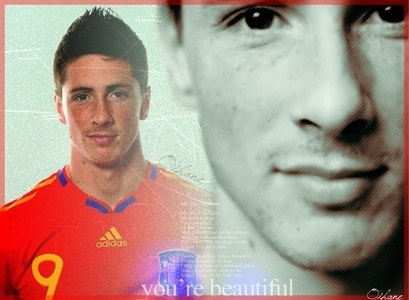 So we all like Torres, probably because of his looks, but if he didn't look like he does would anda still like him? Do anda think Torres looks better with dark brown hair atau stroberi blonde hair?